Leadership, one of the most important yet, unfortunately, looked over personality traits. This trait is one that proved important for Lee Ellis when he was shot down and taken prisoner in Vietnam. The main character is Lee Ellis himself. This book not only shows his struggles in the prisoner camp, but it shows how those experiences can help benefit everyone in their everyday lives. Some of the Struggles he has is the torture. The Vietnamese would torture prisoners in order to get information from them. Another struggle Ellis went through was the lack of communication with other prisoners. They would have to tap codes in a wall or find another way to communicate. You will have to read the book to find out how Ellis overcame all these events. Lee Ellis learned that sometimes in life the circumstances are not what you want but you have to be strong, help others, and make the best of it. I wanted to read this book because I wanted to be a stronger leader. Through boy scouts I have been in leadership positions and try to stand out from the crowd. I felt like this book helped me become a better leader in my community and school. I can relate to the Ellis because he is diligent and tries to keep everyone hopes up in bad situations. This book defiantly lived up to the promise. I this that it has, indeed, helped me become a better leader. The intended audience of this book is young adult and up. It is easy to read. You should read this book because it teaches life lessons that will help in the future. This would be a good book for high school students preparing to go to college because it teaches you to stand up for what you believe in and not to give in at the first sign of trouble. It reads like a motivational speech because it tells Lees stories and then goes on to tell how to use his advice in your life. Because of the format this might not be a good book for someone that likes non-stop action, and would be more for people interested in bettering themselves. The commentary on leadership struggled to hold my attention, but the stories from the POW camps in Vietnam made this a four star book. Col.Lee Ellis, is truly an amazing example for us all. He hits the nail on the head with his leadership lessons as he relates them to his 5+ years as a POW during Viet Nam war. His story...Lee Ellis, a 24 year old USAF F-4 fighter pilot, flew 53 combat missions over North Viet Nam. In 1967, his plane was shot down over enemy territory and held captive in Hanoi and other nearby POW camps for over 5 years. Ejected his plane, was injured, captured, tortured and held captive in various POW camps including the famous Hanoi Hilton. At one point there were close to 500 POWs thrown into various camps. His POW story is about their communication, teaming, mission and relationships, code of conduct, culture and people development. (Yes, they educated each other and held classes and church.) He relates these principles succinctly and effectively to leadership. It really is an amazing story. This is Lee's story and his parallel messages about leadership, leadership with honor. Honor being the significant word. Without question, Lee and the other POWs displayed an exceptional level of unwavering character to adhere to the Code of Conduct and the duty to defend the United States of America. Their perseverance, resilience and dedication to the other POWs and their country made them heroes, heroes that returned to their lives and families to live with a greater sense of purpose and character. LessonsClarify and Build Your CultureOver-Communicate the MessageDevelop Your PeopleBalance Mission and PeopleExploit CreativityTreasure Your Trials and Celebrate Your SuccessesFree the CaptivesSide Note: Lee shares a bit about John McCain, also a POW at the Hanoi Hilton. Broken arms and leg after he ejected. With other injuries from torture and blows to the head by his captors, he was in very bad shape. Eventually POWs were released in the order they were captured. John was to be released early due to his injuries however he opted to wait to be released with the others and not be bumped forward and released early. A wonderful book by a true patriot and hero. In his book Ellis uses vignettes from his civilian consulting experiences and his military leadership roles to illustrate his views on effective and honorable leadership. He shares stories and his experiences as a prisoner of war during Vietnam for more than five years highlighting his first hand accounts of leadership in times that could break men's minds, bodies and souls. In these stories the reader can see that effective leadership can bolster spirits and very literally save lives - both in the moment and years later. Chapters are closed with effective summaries and action steps for the readers to follow to place the observations into practice. A book that should be read and that effectively imparts Ellis's hard earned lessons and provides tips for improving the practice of leadership with character. Great principles that become immediately evident in any sort of leadership or managerial role. The real world examples provided excellent illustrations of the principles in action. There are many books on leadership and personal growth out there. Many of them suffer from being what worked for one person or in one situation now made into a formula that is supposed to work for every personality and in every situation. This book mostly avoids that and has some practical advice along with the author's story of suffering at the hands of the Vietnamese as a POW. He uses his experience and the experience of his fellow POWs to illustrate how to lead starting with how to lead yourself and make good decisions. If leadership lessons and advice on how to make good decisions is the sort of thing that you think might be beneficial, this book is a solid pick up. This book was selected for the Chief of Staff of the Air Force reading list. After reading it I recognize some of the emphasis areas he talks about being used in the Air Force. Now I know where they come from and why. If you are in the Air Force you may get more out of this than the average person for this reason. After hearing Lee speak at a Leadership Meeting, I could not wait to read his book. There are not words to describe how I felt while reading what he and other soldiers were made to endure. They took leadership to the extreme! I admire how Lee took their story and shared it in a way that others could learn, take from it and port tactics into their leadership practices. Job Well Done! End of chapter questions lend themselves well for a self-guided study and creation of a leadership plan aligned with your passion, purpose and personality!Instead of “doing so you can be”, focus on “being so you can do”. Love this!Fearful leaders hang back; courageous leaders develop a game plan and engage the issues. Weak leaders procrastinate, sidestep and avoid; strong leaders confront. Amazing how Col Ellis was able to put together a narrative of his POW experience, from beginning to end, and weave his own leadership insights throughout the book. His lessons on leadership, from within the POW camps to the world of businesses and other hierarchical organizations may prove useful for many, and should cause some to pause for reflection, asking if they're truly acting with integrity, being true to their own core beliefs and doing what's right, not what's easy. Reframing 5 and a half years as a POW into a study in leadership is an incredible accomplishment. Lee Ellis describes the horrific treatment of prisoners through the lens of leadership qualities and what can be learned from the leadership among those same prisoners. It makes us examine our own leadership behaviors through far less threatening scenarios. I highly recommend this book to aspiring leaders and reflective leaders throughout the leadership journey. So you think you have challenges in life? Hardly, read this book and how Lee Ellis (and other POWs) truly suffered for years and came through stronger and returned with Honor. And then to take those hard-learned lessons and make them apply to our lives.....enjoy the read. I thought the book was fantastic. I have to say, it left me teary eyed, especially towards the end. There are plenty of information to help leaders whether in the military or a private organization, but reading through their experiences were very enlightening. Good book, the author used his Vietnam POW experiences to highlight several good leadership techniques. Each chapter has a self-evaluation section at the end to look at your own experiences and see how you are doing in different areas of leadership. There are many books on leadership and personal growth out there. There also lots of books on the Vietnam POW experience. This one uses Vietnam POW experiences to articulate good leadership. Since my interest lies in the latter, I skipped the former. It was still a good read. Wonderful book on leadership with examples of Vietnam Pows, including John McCain. Incredible stories of courage and bravery that I never knew. Generally, the returnees weren't treated well. But many, many did remarkable things that honored them and our country. What a leader he was at such a young age after being shot down--this book teaches so many leadership lessons. I really enjoyed the out come of the book, his insight at business and military life and how the two grew as one. I Highly recommend this book. From captivity to release, Lee Ellis tells the POW story of survival, teamwork, and honor. A very insightful and detailed book; a must-read for all Americans! Good book by a great American. Relatively short book. Honest account of life as a POW in Hanoi, and life lessons learned. Content sometimes tough, as one might imagine. 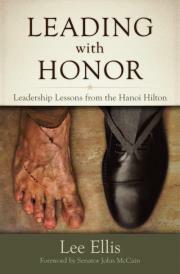 Enlightening and inspirational leadership lessons from a former POW who spent five years in the infamous Hanoi Hilton. Amazing POW book. teaches you how to become a great leader. This book is very interesting teaches you how the pow comunicated. Brought me to great reflection and gratitude for the suffering undergone to maintain our freedoms and to be true to something greater than oneself. You can't feel sorry for yourself reading this book! Inspiring! Excellent book on leadership and the rigors of POW's in Viet Nam. Lee Ellis - Lee Ellis is Founder and President of Leadership Freedom LLC® and FreedomStar Media™. He is a leadership consultant and keynote speaker in the areas of leadership, teambuilding, and human behavior. His past clients include Fortune 500 senior executives and C-Level leaders in telecommunications, healthcare, military, and other business sectors.For his wartime service in Vietnam, he was awarded two Silver Stars, the Legion of Merit, the Bronze Star with Valor device, the Purple Heart, and POW Medal. Lee resumed his Air Force career, serving in command of a flying squadron and leadership development organizations before retiring as a colonel.Lee has a BA in History and a MS in Counseling and Human Development. He is a graduate of the ArmedForces Staff College and the Air War College. He has authored or co-authored four books on leadership and career development.Lee and his wife Mary reside in the Atlanta GA area and have four grown children and six grandchildren.